I wanted to thank you for making Bourbon Heat the Mean Green Headquarters for the weekend we played Tulane. Perhaps we will have the good fortune to come back to the Big Easy! Once again, everything exceeded our expectations. Thanks for the outsatanding customer service and venue. We just wanted to let you know that we had the BEST time at your club. We enjoyed Nic's hospitality in the Carriageway Bar and the female bartenders as well, while we were there. They made us feel very welcome for being there the first time. we will be coming back soon. We love New Orleans and Bourbon Heat. Thank you again for a great time. Thanks to Bourbon Heat for helping make the Silver Plume a huge success! The after party was a blast! The League Office would like to thank you all for all of your help leading up to and during our Arena Bowl XXV Week. We're glad we chose your bar. Our After Party was a success! We'll definitely keep you in mind for future refrences. Thanks again. 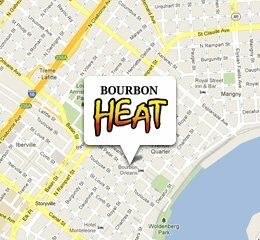 Since opening, Bourbon Heat has quickly become a favorite recommendation for many of city’s concierges to send visitors for one of the cleanest, most reliable, safest and professional establishments on Bourbon Street. We see many visitors every day and the vast majority are anxiously asking us “How do we get to Bourbon Street?” There was a need for a very long time for a nightclub and sports bar venue on Bourbon Street that was clean enough and friendly enough to send out-of-town guests, Bourbon Heat definitely provides that option. I admit that when my own mother was visiting me recently from Pennsylvania I took her to Bourbon Heat. Bourbon Heat offers an atmosphere that no other Bourbon Street nightclub offers and management truly cares about both their guest and the community. It goes without saying that everyone had a great time and truly enjoyed our visiting Bourbon Heat. 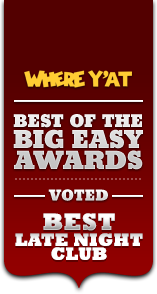 You have a terrific place and your staff could not have been more accommodating! We look forward to referring Bourbon Heat to many others, including our valued travel partners, groups and anyone else either sailing from or visiting New Orleans. Let me thank YOU and your team for a wonderful “Happy Hour” at Bourbon Heat. As discussed, the various environments your establishment offers is fantastic. I had a chance to wander through the court-yard, peak into the bar downstairs and, of course, enjoy the club upstairs. You were a shining star on Bourbon Street last Wednesday!!! Thank you so much for your flexibility and service!! The event would not have been successful without that!! Let’s do it again as soon as possible!! We’ll try to get something to you again as soon as possible. Thank you so much for hosting our casting call on Saturday! The venue was perfect for what we needed and I really appreciated your hospitality. The coffee and beignets were delicious! Hope to swing by next time I make my way out to New Orleans! Thank you so much for coming on board to be the host and venue of our Hell's Kitchen Season 11 & 12 Open Call - We are super excited to head your way and get a great turn out!